My first breakfast of the year was from Nigella Lawson's book, Feast. To imitate Nigella's words and sentiments, it was a sweet breakfast, with the aim of ushering in a year of corresponding sweetness. Arabian Mornings - "This is not so much a recipe, more an enthusiastic suggestion: a scented, simple salad with which to greet a turquoise-skied summer's day". This salad consists of chunked watermelon, sprinkled with fresh mint and rosewater. 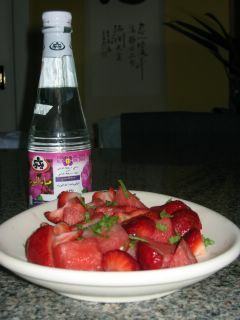 Optionally, you can include some ripe, quartered strawberries. I chose this option. I had read this recipe a long time ago, but had never been keen to make it. It just sounded too simple, boring even. I couldn't conceive of how those three ingredients together could make a whole, cohesive dish. But this morning, I wanted something light to eat, and I had all the ingredients at hand, so I thought I'd give it a try. I was wrong; it was lovely. It's everything Nigella says it is - fragrant, delicious, uplifting. Today wasn't exactly "turquoise-skied", (yesterday's 43 degree heat was replaced, suddenly, by cold winds, clouds and heavy rain), but upon eating this salad, I stopped caring. Later in the afternoon, I was deep in domestic goddess mode, and in the midst of baking some mini rhubarb meringue pies, I was suddenly inspired. There was some sweetened rhubarb pulp which wouldn't fit into the pie cases, so I layered them in a glass with Greek yogurt (leftover from hummus), some Andy's Fairfield Granola, and light muscovado sugar. This was basically an amalgum of Nigella's Raspberry and Oatmeal Swirls (also the Breakfast chapter of Feast) and the rhubarb and muesli compote which is sold at my favourite cafe on campus. 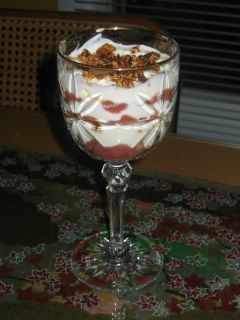 The former consist of frozen raspberries layered with icing sugar and crushed Hobnob biscuits; the latter is layers of rhubarb compote, yogurt, and muesli. It was absolutely lovely! I was thinking of saving it until tomorrow's breakfast, but my bro walked into the kitchen and declared, "That looks fantastic! Can I eat it?". So, we shared it. I highly recommend this for a breakfast that feels like a treat, but not guilt-inducingly so.